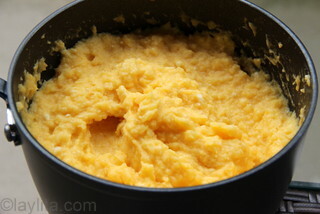 Molo is the Ecuadorian version of mashed potatoes, made with a refrito or sofrito of butter, onions, garlic and achiote. 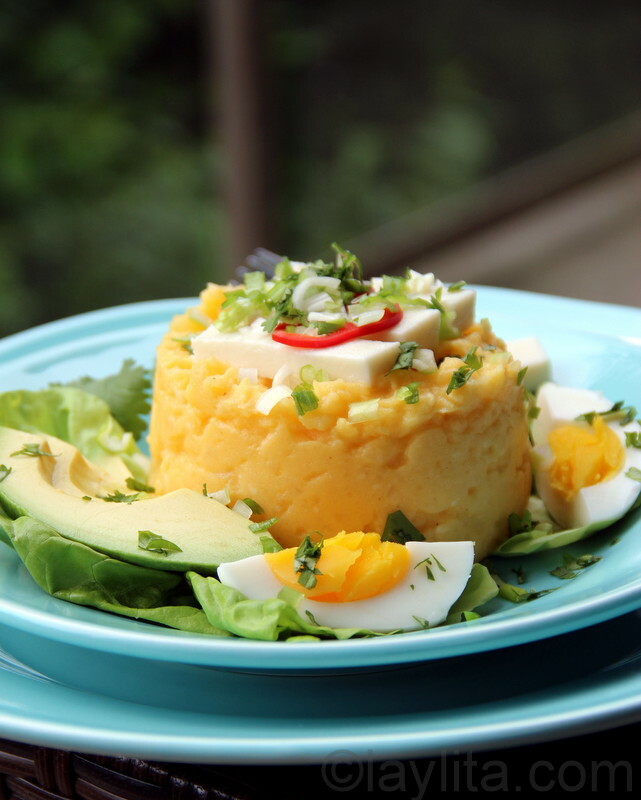 These delicious mashed potatoes are served with queso fresco, hard boiled eggs, scallions or green onions, avocado slices and other garnishes. 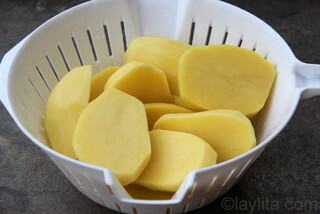 Molo is usually served during Easter and is eaten after the traditional fanesca or Easter soup. However, I love to make mashed potatoes this way, and molo makes a great side dish for any meal – so I prepare this recipe very frequently. I also always make molo style mashed potatoes for holidays like Thanksgiving or Christmas; it’s a great way to incorporate a traditional Ecuadorian dish into these holidays. 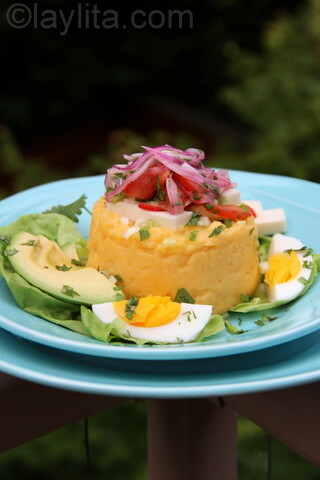 Molo is an Ecuadorian version of mashed potatoes made with milk, cream, queso fresco and a refrito of onions, garlic, and achiote or annatto. 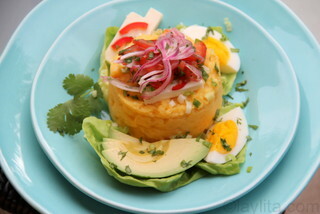 Molo is served with lettuce leaves, hard boiled eggs, hot pepper slices, avocados, scallions, cilantro or parsley, tomato and onion curtido and aji or hot sauce. 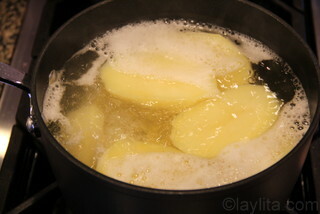 Peel the potatoes, cut them in half and boil until soft, about 30 minutes. Drain and save until the refrito is ready. 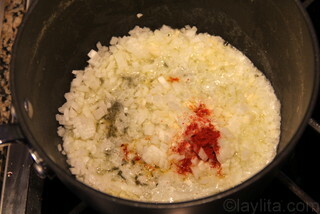 In the same pot that the potatoes were cooked, prepare a refrito by melting the butter over medium low heat and adding the diced white onions, diced garlic, achiote powder and some salt. 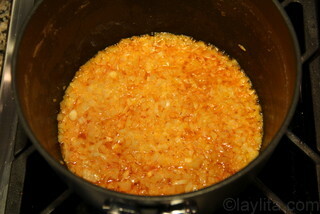 Cook until the onions are translucent, about 7-10 minutes. 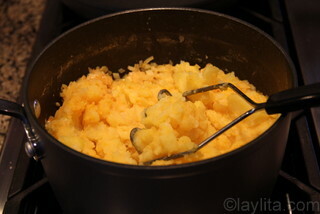 Add the potatoes and milk to the refrito and use a potato masher to mash the potatoes until they are smooth and creamy. 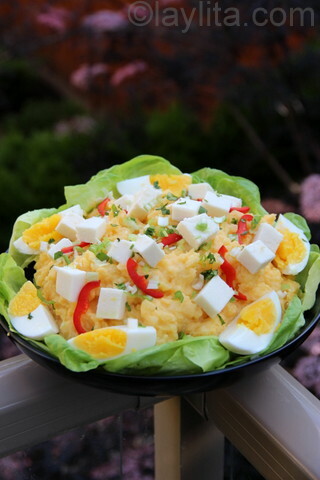 Serve immediately, can be served in individual plates or in a large serving bowl garnished with lettuce leaves, queso fresco cubes, quartered hard boiled eggs, avocado slices, slices of peppers, chopped scallions and chopped herbs. The tomato onion curtido and aji sauce can be served on the side and added according to each person’s preference. 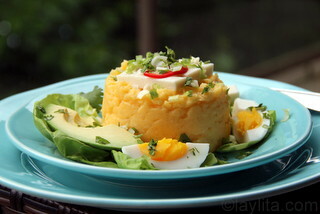 These are my favorite mashed potatoes ever, once you try mashed potatoes with queso fresco, avocado, hard boiled eggs, and the rest of the garnishes, it will be very hard to go back to eating plain old mashed potatoes. 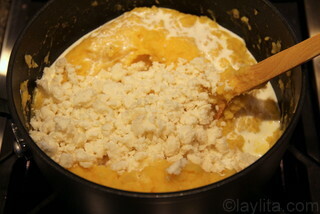 There are other variations of molo; some add ground peanuts or peanut butter. The exact garnishes vary from one family to another, but in general, queso fresco, hard boiled eggs and scallions are must have garnishes for molo in most households. 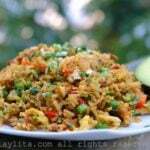 In my version of molo I also like to add some avocado slices, aji criollo hot sauce, and tomato onion curtido salsa. 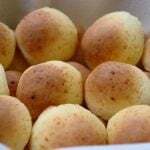 You can serve the molo individually using a ramekin or small bowl as mold, or you can also place it in a large serving bowl and decorate with the garnishes. 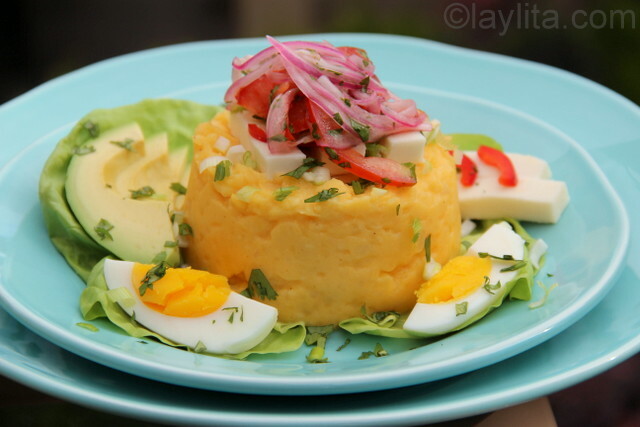 I’ve been looking for an Ecuadorian mashed potato recipe after I had some as street food with some gorgeous pork in Madrid a few years back. This looks like exactly what I’ve been looking for, I’m definitely going to make this. Thanks! 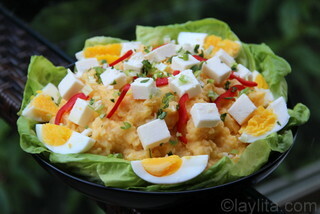 It looks really wonderful and the picture with the egg perfection. You cook a great egg, my friend!